Keeping our families healthy. It is absolutely a forethought in all parents minds. Sometimes though, it seems like we’re implementing things because we know we should be, or think we should be, but without a real comprehension as to the way things help our bodies. Understanding is just as crucial as taking the action. Why? Well, because when we can explain to children WHY they need to eat their vegetables, and not just because we said so, it motivates them to do something good for their bodies. The same thing is true for adults; it’s simply human nature. This is why knowing the role of enzymes, and what they do for your body is so important. They are vital to our well-being. At 1st Step Family Wellness in Kirkwood, we strive to continue to educate our patients on the why. Boy: “Why?! I hate broccoli! Sure it’s true eating proper food to get essential nutrition is about more than growing big and strong, but that is something, say a 5 year old boy can understand and relate to. For adults we need a more detailed explanation to help us stay on track, and remind us why we want to opt for the veggie tray at the office, over the donut box. Our inner 5 year old wants to grab that donut, because obviously, it’s delicious. We know the veggies are a more ideal option because they are healthier. Today I want to give you more information on what healthier choices have to do with the enzymes in our bodies, and why that is important, because the child in all of us needs that extra information to keep us on track and make good choices. Enzymes are proteins that act as a catalyst in our bodies by breaking down the food we eat. The food is broken into particles small enough to be absorbed by the cells that line the intestinal tract. Raw fruits and vegetables contain the enzymes necessary to break down the food themselves without requiring much assistance from our bodies to produce them. 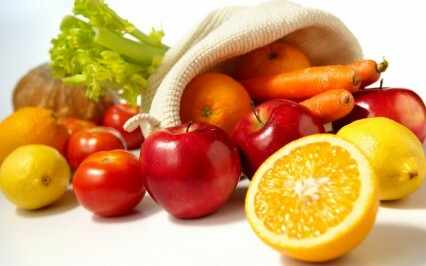 Therefore, eating raw fruits and vegetables is much less taxing on our digestive system. By consuming large amounts of processed foods that do not offer any enzymatic assistance, our bodies can become enzyme deficient over time. While digestion is a huge component of the job enzymes perform, it is not the only one! Enzymes are extremely complex biomechanical substances. Enzymes play a role in almost all aspects of our health and well-being. They make our hearts beat, help us breathe, aid in thought process, energy production, healing wounds, dissolving blood clots, slowing the aging process, and even help with muscle and nerve function! What types of enzymes are there? 2-Amylases-These enzymes handle breaking down carbohydrates into simple carbohydrates (pasta, potatoes, cookies, etc.) The amylases are essential to breaking down milk sugar, refined sugar, and malt sugar. It can be hard to grasp how complex our bodies are! Quite literally, without enzymes, we would cease to exist. This is why we have to be incredibly conscious of what we are putting in our bodies. We need to ensure we are providing the proper nutrition to keep things operating. Not putting the right nutrition in our bodies, is like putting diesel in a car that takes unleaded gasoline, and then wondering why the car broke down! The greasy processed foods, overcooked foods, and refined sugars, are our equivalent to putting diesel in a vehicle that takes unleaded. How do I know if if I am enzyme deficient? These can all be signs of enzyme deficiency. Of course, it should always be evaluated to ensure there isn’t something else occurring, but these are signs of enzyme deficiency. It’s unfortunate to see so many people that are forever on antacids because they simply do not know they only need to increase their enzyme-rich food intake, and possibly need a supplement to boost the enzymatic processes back up. Doing these two things will work wonders for relieving the above listed digestive issues people complain off! So, what happens if I don’t handle my enzyme deficiency? This is where the marvel of how food and nutrition can truly heal a body is awesome in the truest sense of the word. However there are an enormous amount of people who suffer from enzyme deficiency. In fact, over $80 billion per year is spent to relieve digestive issue like irregularity, fatigue, gas, and headaches. What’s the best way to fix my enzyme deficiency? As mentioned a few times through this article, consuming raw fruits and vegetables are the first step in restoring the efficiency of your enzymatic processes. Sometimes though, a person’s body may be so deprived, and overworked, that enzyme therapy is also necessary to restore a body back to full health. This is a simple process of consuming recommended whole food supplements that will aid your recovery. Speak to your chiropractor today, or contact us for a consultation if you have more questions or concerns. Also remember to teach your children now the importance of good nutrition by explaining things in an age appropriate manner. As children get older, revisit the subject with more specific detail that they will then understand. Knowledge is powerful, and so are our bodies when properly cared for!